Can I Trust the Hype Behind Invisalign®? Over the last decade or so, the popularity of Invisalign® clear aligners has soared, and for good reason. Patients who’ve previously debated dealing with their crooked teeth or wearing metal braces to correct them no longer have to choose. They can enjoy a straighter smile without having brackets and wires semi-permanently bonded to their teeth. Invisalign® is a system of clear orthodontic aligners that are digitally designed to guide crooked teeth through corrective movements. Instead of a wire that your dentist tightens, each aligner progresses your treatment through a specific phase, and is then replaced with the next in the series as you continue. True to their name, they also remain virtually invisible even from up-close inspection. Invisalign® aligners are crafted from clear, BPA-free acrylic that conforms precisely to the shape of your teeth and dental ridges. The combination of virtually invisible material and a firm, comfortable grip ensure that your aligners are unnoticeable even as you speak, smile, and bite and chew your food. Will they affect my dietary needs? Unlike braces, aligners are constructed as single appliances that you can temporarily remove when necessary. This means you won’t have to make any drastic changes to your diet or find ways to work around specific dietary needs to accommodate your braces. How easy are they are to care for? As much as confidence and convenience matter, one of the biggest benefits of Invisalign® aligners is their easy care and maintenance. Because they can be removed, you can more effectively brush and floss your teeth as well as clean your aligners regularly to avoid oral bacteria and food particles from lingering too long. 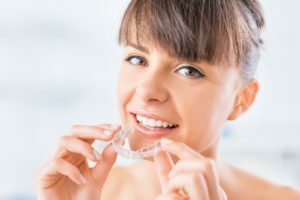 It really isn’t too good to be true – with custom-designed Invisalign® clear aligners, you can enjoy the straighter and more attractive smile you deserve without the hassles that come with traditional braces. To schedule a consultation, call Modern Smile in North Hollywood, CA, today at 818-763-9353.